Why do we need centrifugal pump? As we know, solids control equipment is used in drilling mud purification system that includes many equipments, such as shale shaker, mud cleaner, centrifuge, pump, mud agitator, etc. But the centrifugal pump is one of the most widely used pumps in drilling mud system. This type of pump can move high volumes of liquid in a relatively efficient manner. This pump is very dependable, has relatively low maintenance requirements, and can be constructed out of a wide variety of materials. It is an indispensable equipment and plays a critical role in the whole drilling mud system. Drilling mud is a kind of suspension that contains a large number of solids particles and various chemical additive, and we usually use centrifugal pump to transport drilling mud also as feeding pump for desander, desilter, or as mixing pump for jet mud mixer. Drilling fluids centrifugal pump has a big difference in the solids control system. It can also be utilized as trip pump and supercharging pump. A centrifugal pump is a pump that consists of a fixed impeller on a rotating shaft that is enclosed in a casing, with an inlet and a discharge connection. As the rotating impeller swirls the liquid around, centrifugal force builds up enough pressure to force the water through the discharge outlet. The centrifugal pump has many advantages which make it one of the most widely used types of pumps in the wastewater industry. Centrifugal pumps are characteristic of abrasion resistance, smooth and stable running, reliable sealing, long service life and convenient maintenance. 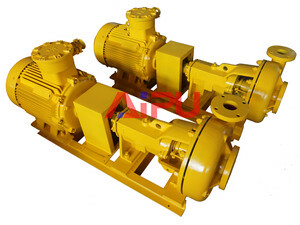 The centrifugal pump produced by Aipu solids control have been used for land and offshore drilling platforms in more than 20 countries over the world. Aipu solids control always insists on winning the market by product upgrading and technical innovations, keenly grasps the customers’ demands and enjoys a high reputation in the industry for its stable product quality, personalized product, customized services and perfect global after-sales services. If you want to know more about centrifugal pump or need other solids control equipment, please feel free to contact us.